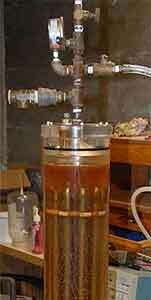 Techniques for using electrolysis to break apart water molecules into a mixture of hydrogen and oxygen had been known centuries before Michael Faraday did his quantitative electrolysis experiments in the 1830s. Today the mixture of gases produced by electrolysis of water is commonly termed “Hydroxy Gas” or Brown’s gas (named after Yul Brown who researched and promoted this technology for many years). A detailed history of hydroxy gas can be found in Robey (2006). Stan Meyer’s “water-powered car” as seen in January 2008. Many researchers have developed techniques for producing this gas in order to add it into the fuel stream of a fossil fuel burning engine, where it has been shown to increase the efficiency of the engine and reduce pollutants by a claimed MPG percent increase of between 10 to over 50%. One of the many problems with this technology is that a lot of electrical energy has to be used to produce the gas, so that burning the gas alone to power a generator to produce power to produce the gas just does not work. There are just too many inefficiencies in the loop. However, in recent years a number of different inventors have developed technologies that produce hydroxy gas in quantities much greater than would be predicted using standard “brute force” electrolysis. 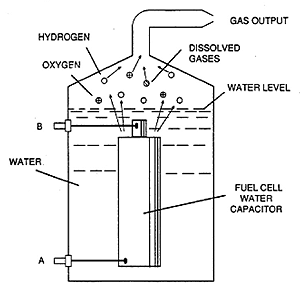 These techniques typically include a combination of multiple high frequency pulsed voltages applied to specially designed electrolysis cells that resonate the water molecule, basically causing it to “shake” apart with a much reduced amount of electrical power per unit gas produced. Some of these techniques are described in research papers by Meyer (1997) and Griffin (1993). We are presently working with several of these research groups with the intent of bringing them together to optimize these technologies in order to be able to close the loop and produce a 5-10Kw generator running only on water. US Patent 4,936,961, June 26, 1990. 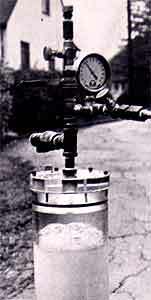 BELOW: Stan Meyer’s Central Heating Controller Unit for the Water Heat Resonator Tubular Array. Developed for heating a house. 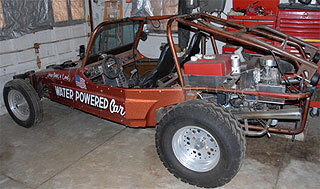 In late January, Dr. Ted Loder, representing The Orion Project, was invited to meet with the owners of much of the late Stan Meyer’s technical materials including his famous water powered dune buggy, his fuel cell shown in many articles, his heat resonator system, technical papers and laboratory materials. Since then, The Orion Project has been in discussions and negotiations with the owners as they worked through their own needs and plans. Since information regarding these materials has been made public recently, we have decided to show several pictures of some of the technical materials we were shown in January, 2008. As can be seen in these photographs, some very interesting technology is available, but some has been partially disassembled and must be carefully researched, reassembled and tested. We thank the owners of the technology for the opportunity to observe Stan Meyer’s materials. Photo of the Grove City Record from October, 1984 showing pictures of Stan Meyer, his water powered car and the ‘fuel cell,’ later demonstrated to Dr. Loder in January, 2008.